​Eye exams by your child's doctor are an important way to identify problems with your child's vision. Problems that are found early have a better chance of being treated successfully. What are warning signs of a vision problem? Babies older than 3 months should be able to follow or track an object, like a toy or ball, with their eyes as it moves across their field of vision. If your baby can't make steady eye contact by this time or seems unable to see, let your child's doctor know. See Infant Vision Development: What Can Babies See? for more information. Before 4 months, most babies' eyes occasionally look misaligned (strabismus). However, after 4 months, inward crossing or outward drifting that occurs regularly is usually abnormal. If one of these is present, let your child's doctor know. If your child's eyes become misaligned, let your child's doctor know right away. However, vision problems such as a lazy eye (amblyopia) may have no warning signs, and your child may not report vision problems. That is why it's important at this time to have your child's vision checked. 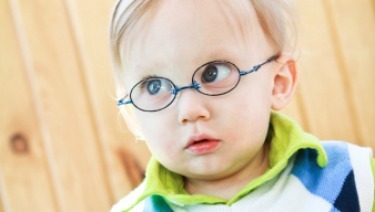 There are special tests to check your child's vision even if he cannot yet read. Eye pain, itchiness, or discomfort reported by your child.